Sometimes it's possible make the right choice and the wrong choice at the same time. Barrel Roll has spent the better part of his adult life preparing for each shot to be the one that counts the most. He understands that seriousness of his role on the GI Joe team and trains constantly to be ready at a moment's notice to do what must be done, as the lives of civilians or his fellow soldiers will be on the line. A strong love for country and team was infused into him at an early age by his father, who served in the Navy as a navigator on a P3 Orion. Barrel Roll's father taught his children the strength of family and teamwork. This made his brother's betrayal all the more bitter. In simpler times the Stall family would spend summers together at Dale Hollow Lake camping, shooting, and cliff diving. Now, those memories have been erased by a rash decision on a training mission that ultimately drove Barrel Roll's older brother Black Out into the grip of Cobra. At first he hoped to bring his brother in, but after learning of his complicity in the diabolical kidnapping of their younger sister, he is now prepared to do whatever it takes to make sure Black Out never hurts anyone again - no matter what toll it takes on his own soul. Of all the new characters introduced in Generation 2, Barrel Roll was among the best. He had a cool design, a unique role on the team, and a backstory that was on-par with the drama between Snake-Eyes and Storm Shadow. Hasbro must have thought so too, because in three years, they released three different versions of him. 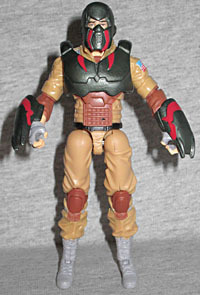 The original came out in the SpyTroops line, the second was in Valor vs. Venom, and the third was one of the DTC releases. While the original (aka, the one most people know) was wearing blue, the next two were wearing brown, and this update sadly follows suit. So they chose right by making this character, but chose the wrong color for him. 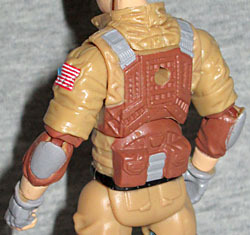 The figure's mold is mostly taken from Pursuit of Cobra "Desert Battle" Duke (the one with the big rocket launchers or whatever), but the arms come from Resolute "Arctic" Duke. The Snow Serpent's belly parachute pack completes the ensemble. The mold choices work well - he definitely looks like a paratrooper of some sort or another - but again, blue > brown. The padding on his chest, elbows and knees makes sense for someone who'd be spending a lot of time laying prone, too. Several fans have made their own custom G3 Barrel Roll figures, often using these same parts: the most common difference being Ace's legs. And blue paint. Because Barrel Roll is supposed to be blue. The head is another disappointment. It's based on the third G2 toy, which for some reason had a different head than the previous two. The original, as you know, was sculpted to look like the character's namesake: Dwight Stall, then-lead-designer for GI Joe. Now he's senior production designer for Marvel Legends, but does that really mean the toy can't look like him today? In addition to the Snow Serpent's belly-warmer, Barrel Roll comes with a black Barret M107 sniper rifle wrapped with brown cloth, and a gray pistol. He's wearing the stupidest-looking helmet of all time (taken from that same G2 figure that gave us this wrong head), and comes with a repaint of Resolute Duke's jetpack. This is a nice nod to his origins as a "high-altitude sniper," but the brown looks out of place here, too: it's machinery; shouldn't it be gray? The wings spread and contract in unison, thanks to a gear system, and the two stabilizing fins are mounted on balljoints. The helmet is just an awful choice, though. It makes him look like he should be riding the short bus, not flying into combat. Something more like his SpyTroops "Raptor-Viper" armor (which this figure can wear with some work) would have been preferable. Barrel Roll is a great GI Joe character, and it's nice that we finally got a G3 update of him. 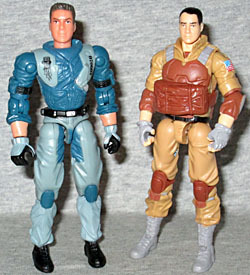 The only (real) downside is the fact that the GI Joe Collectors' Club, with no explanation, made him the wrong color.